Isaac Abare, seated, middle, signs a letter of intent to attend Wilmington College where he will continue his education and his swimming career. Joining Abare for the occasion (front, left), his mother, Janet Abare and at right, swim coach Katie Kasberg and in back, (l-r); his father, Andrew Abare and his sisters, Debbie and Lydia Abare. 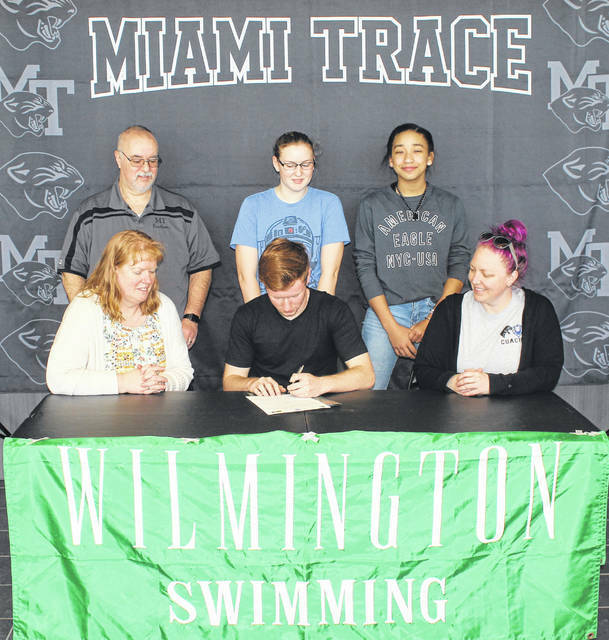 Miami Trace High School senior Isaac Abare recently signed a letter of intent to attend Wilmington College where he will continue his education and his athletic career as a member of the Quakers’ swim team. Abare excelled in the 200 individual medley and the 100 freestyle, setting the school record in the 200 IM (2:39.27). He also holds the school record in the 100 butterfly (1:26.32). “I was looking at Wilmington and the University of the Cumberlands (Kentucky), Cedarville University and Cornerstone University (Michigan),” Abare said. Abare finished the season with personal best marks of 25.18 in the 50 freestyle and 56.63 in the 100 freestyle. “I had the privilege of coaching Isaac for Y team for several years, as well,” Kasberg said. “He used to come out and swim for the Y as well. It’s been incredible to watch him grow over the course of several years and see him develop into the swimmer he is now. 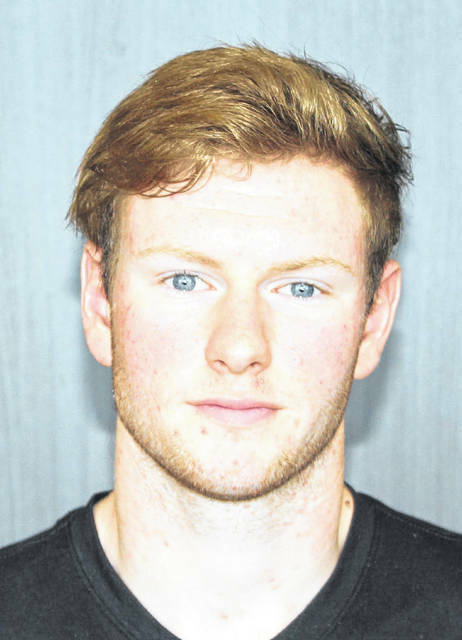 “I think Trip (Breen, Wilmington head swim coach) and the program at Wilmington College will be a great fit for him,” Kasberg said. “It was a fun season,” Abare said. “Especially being able to combine with Court House’s team, being able to make more friends through that. “Having longer practices was more beneficial,” Abare said, as practice times increased from one hour to two hours. “You can have more time to work on different strokes,” Abare said. “Work on breathing a lot longer. “With that, I was able to drop a lot of time on my 100 freestyle,” Abare said. “Especially when it came to Sectionals. I dropped three seconds at Sectionals from my previous best time. Kasberg took on the combined duties of coaching both Miami Trace and Washington High School swim teams in 2018-19. Abare was also asked about the transition from the original Miami Trace High School, which he attended for over three years, to the new high school, from which he will graduate in May. “The transition itself went fairly smoothly,” Abare said. “The facilities are beautiful. The band room, the fine arts department, the science wing. I only have two classes here. The science wing and the performing arts, those facilities are just amazing. “When I was first able to walk through the building, I was astonished by how beautiful it was,” Abare said. “You’re never going to get along with everybody on a team,” Abare said. “But you’re going to find those people on a team that you can make connections with and that you can be friends with. People you work well with that can push you and you can push them at the same time. At Wilmington College, Abare will be studying athletic training.